The Newest Rant: Oh Snap, "The Last Guardian," Actually Comes Out Tomorrow! Oh Snap, "The Last Guardian," Actually Comes Out Tomorrow! As someone who loved, "Ico," and admired what, "Shadow of the Colossus," set out to do even if I didn't like it quite as much, the long and troubled development history of, "The Last Guardian," is something I've followed off-and-on throughout its many, many, many years (when five years is an eternity in video-games taking nearly double-that is madness). I of course recall when it was announced by Sony how the game was for sure alive and would be out sooner than later, but I thought something would eventually happen to delay it into nonexistence. I mean, these games that enter development Hell either never escape or come back as horrific examples of things that should have stayed dead ("Duke Nukem: Forever," is a prime example). Imagine my surprise then when I was reminded that, 'The Last Guardian," in fact comes out tomorrow. The reviews that are out so far seem to be quite positive overall and the review entities I tend to trust (Kotaku and Polygon, oh and Rockpapershotgun is good, but they only talk about PC games) had mostly positive things to say. I am going to try and rent/check out from the library a copy of this soon for sure and look forward to booting it up on my Playstation 4. Oh, and if you have a Playstation 4 Pro you can enjoy even snazzier (apparently) graphics. Though if you already have a Playstation 4 you know my feelings about anyone going out and buying a Pro. 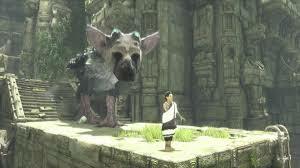 So yeah, "The Last Guardian," is actually coming out. Now we just need, "Shenmue III," to be finished and, "Half-Life 3," to at least be announced and all the mythical games will have entered reality in some shape or form.